Mnuchin helped produce the hit movie “Wonder Woman,” which grossed $90 million in China — but because of China’s restrictions on foreign films, the producers received only a small percentage. In 2017, he divested his stake in a film production company after joining the White House. But he sold that position to his wife, filmmaker and actress Louise Linton, for between $1 million and $2 million, the Center for Public Integrity reported this month. At the time, Linton was his fiancée. Mnuchin’s 2018 disclosure, which was obtained by the Times, shows StormChaser listed as one of Linton’s assets. Because the couple is now married, the asset is considered Mnuchin’s. And he is owed that same $1 million to $2 million, with additional interest, from the company in 2026, the 2018 form disclosed. “I am advised by people at Treasury that I am fully in compliance and I have no ethical issues,” Mnuchin said at the hearing. The Office of Government Ethics has not yet certified his 2018 financial disclosure, the first since his marriage to Linton, the Times reported. 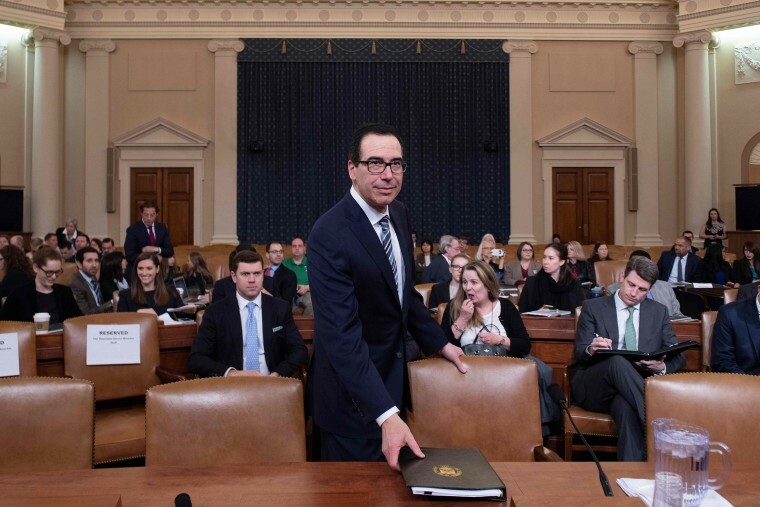 Since trade talks began last year, film lobbyists have met with Mnuchin’s top deputies and officials from the Commerce Department and the office of the U.S. Trade Representative. Mnuchin has reportedly been particularly responsive to lobbying from the film industry. StormChaser did not immediately respond to CNBC’s request for comment.